We had our annual Tree Trimming Celebration at Mama & Pops’ this past Saturday. 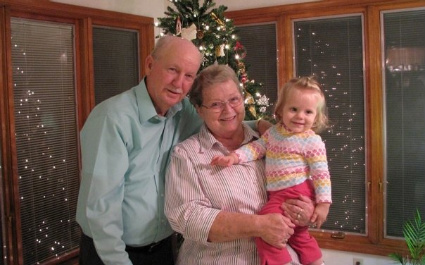 Here’s a shot of Mama & Pops with the Nugget (great-granddaughter Addi) in front of the tree. This entry was posted on Wednesday, December 2nd, 2009 at 8:30 pm	and is filed under Photos. You can follow any responses to this entry through the RSS 2.0 feed. You can leave a response, or trackback from your own site.